Just today, I was matching up the clothes that were completed, namely the contrast collar blouse and mesh lace shorts. 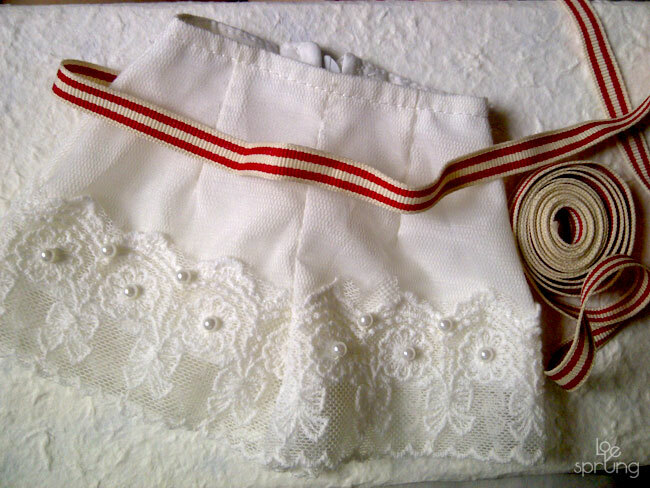 I found that the shorts would look nice with a cute little ribbon bow belt and some pearl accents. It has been a while since we released non-limited runs of clothes. I hope we can make some basics that are priced inexpensively so more people can afford our clothes. :) Most of our releases have been limited due to the limited amount of material we have. For instance this lace we used for the mesh shorts, it was only enough for three pairs for each size. I seldom buy materials in bulk, but when we do, we get to make basics! Hee. Oh, earlier this afternoon I was searching up Unoa on Yahoo!Auctions and found this amazing Japanese unoa owner who sews modern clothing. She is called Atri, and she is such a diligent designer. Quite a few of the designs I have wanted to make for dollies (and have yet to touch on), she has already created them. *-* My new dolly fashion idol! She makes beautiful lingerie sets too, with pleasant combinations of various prints. Ohh can't wait to see the shorts finished I luv the ribbon ye chose! And Atri has Unoa elders luv the lingerie :). OHHH looking forward to it! !